This is what happens when a few Mad Maxian black thumbs get their hands on a broken Huey and a working trophy truck. I am so thankful to my friends who encouraged me to lay out a proper foundation for this piece, and who gave me a few suggestions and paintovers along the way. If I have time, I still feel like I would like to revisit this, take off the Christmas tree and comp in a full environment concept. Im a bit doubtful on if I'll get there, but am feeling like it is the right thing for me to do. A few directions that ended up at the Helicopter + Wheels design. One technique that I probably don't use as much as I should is block modeling. It's something I've used infrequently for years but since the lengthened development time and increased complexity rarely pay off for the scale of work I tend to do I usually just sketch through the tricky parts. With some coaxing from a friend I decided to do it for the 4th design in the "vehicles that shouldn't have wheels" series I am currently riffing through. A render of the Frankenstein Sketchup model at what I would consider my usual 3/4 angle of comfort. 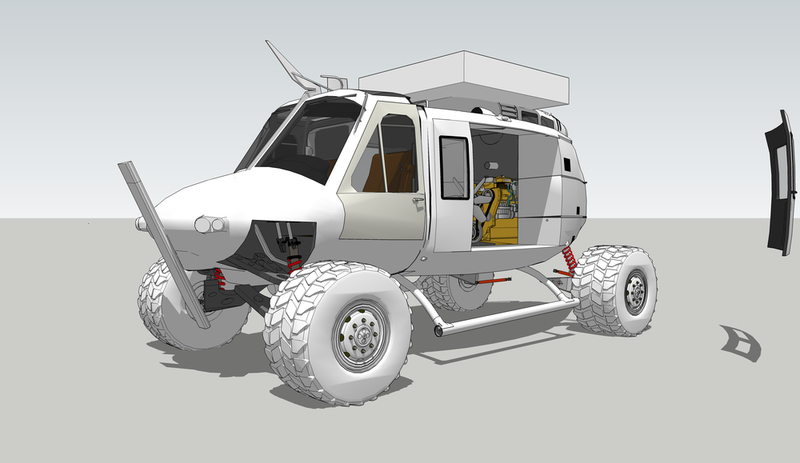 Since Hueys have some pretty fun organic shapes to them - and since Sketchup's 3D warehouse has more than I need to 'kitbash' this thing together I decided to go for it. I wanted to go with the front cockpit of the 'Venom' model but kept the body from the original Huey because the top engine cowling is more streamlined. Here is what will probably be the final camera angle that I will render with. Since my goal was only to model this up to ~50% I don't really have any drive to take this into keyshot and render passes or anything. I want to keep this process fast and loose which is always something i struggle with when building upon a 3D foundation. Hopefully I can do this more often and find a better balance.